After days of rain, the weekend is looking sunny and warm. According the Northeast Regional Climate Center, there has been six days of measurable precipitation at Sikorsky Memorial Airport in Stratford. Since last Saturday, Sikorsky has had 2.69 inches of rain. Danbury airport had 1.44 inches during the same period; Tweed-New Haven Airport received 1.81 inches. After some patchy drizzle Friday morning, it will remain mostly cloudy with high temperatures in the upper 70s. The National Weather Service says high pressure centered over northern New England will build south Friday. The high will then remain over the region through the weekend. Sunshine will be more abundant Saturday and temperatures will climb to slightly above seasonal normals, reaching into the lower 80s. 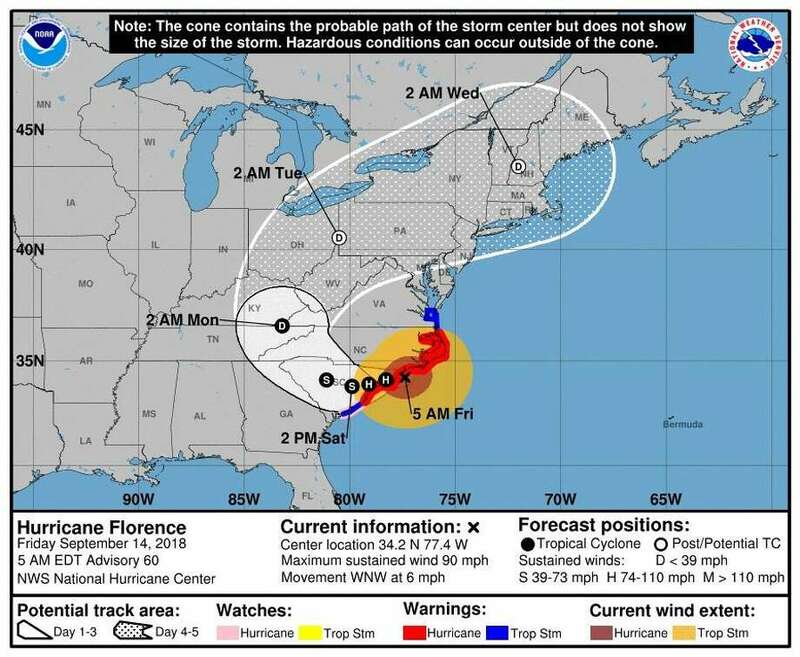 The NWS says Connecticut could see some remnants of Hurricane Florence late Monday through Wednesday. A map from the National Hurricane Center Friday morning shows Connecticut could receive up to an inch of rain from Florence’s remnants. In its 5 a.m. advisory, the NWS said Florence was 25 miles east of Wilmington, N.C. with sustained winds of 90 mph. “Florence is moving toward the west-northwest near 6 mph,” the NHC said. “A turn toward the west at a slow forward speed is expected today, followed by a slow west-southwestward motion tonight and Saturday. On the forecast track, the center of Florence is expected to move inland across extreme southeastern North Carolina and extreme eastern South Carolina today and Saturday. Florence will then move generally northward across the western Carolinas and the central Appalachian Mountains early next week. Remnants from Florence are expected to track northeast in Ohio and Pennsylvania by 2 a.m. Tuesday. Early Wednesday morning it should be over New England. In another map of Florence’s track, western New York and most of New England could feet some wind from the remnants Tuesday morning. At 5 a.m., Connecticut was in the 5 to 10 percent probability of getting tropical force winds Tuesday or Wednesday. “The wildcard will be how the remnants of Florence proceed,” the NWS said in its weather discussion. Today: Patchy drizzle and fog before 7 a.m. Mostly cloudy, with a high near 76. East wind around 9 mph. Tonight: Mostly cloudy, with a low around 64. Southeast wind 5 to 7 mph. Saturday: Mostly cloudy, then gradually becoming sunny, with a high near 80. Northeast wind 3 to 5 mph. Saturday Night: Mostly clear, with a low around 62. South wind around 6 mph becoming calm after midnight. Sunday: Sunny, with a high near 78. Light and variable wind. Monday: A 30 percent chance of showers after noon. Mostly cloudy, with a high near 77. Monday Night: A 50 percent chance of showers. Cloudy, with a low around 67. Tuesday: A 50 percent chance of showers. Cloudy, with a high near 79. Tuesday Night: A 50 percent chance of showers. Mostly cloudy, with a low around 66. Wednesday: A 40 percent chance of showers. Partly sunny, with a high near 78.